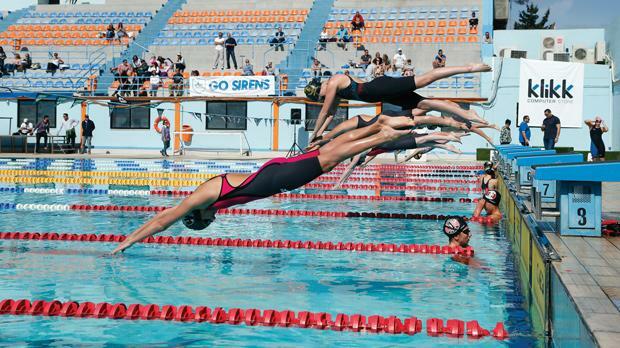 The 2015 Easter International Swim Meet, sponsored by Klikk, was this year’s main attraction of the international calendar for meets held in Malta. This time it was also a platform for Maltese top swimmers to qualify for the upcoming Games of the Small States of Europe in Iceland. This target was achieved by Andrew Chetcuti whose 56.27 in the 100 metres butterfly was 0.71 seconds inside the Minimum Qualifying Standard based on the third-placed time of the previous Games. However, in some other races the threshold was narrowly missed. Other highlights of this annual event, which drew participation from ten local and four foreign clubs, were three national records, including a relay event. Julian Harding’s 1 minute 05.01 seconds in the 100 metres breaststroke was 13 hundredths of a second faster than his previous national mark set in December two years ago in Berlin. It was also the best technical achievement by a Maltese swimmer. Amy Micallef, also of Neptunes, improved her six-month old national record by 1.11 seconds when clocking 1 minute 15.67 seconds in the 100 metres breaststroke. She also broke the 50-metre breast stroke national record clocking 34.43 seconds. The national mark in the team event came in the 4x100 metres freestyle relay. The quartet of Raoul Stafrace, Matthew Galea, Matthew Zammit and Andrew Chetcuti completed the race in 3 minutes 32.87 seconds, a time which was 1.88 seconds faster than the old record set in July 2013. This time Sliema’s Galea was the new member of the team. All in all, this year’s Easter Meeting was well patronised, with several familiar Maltese swimmers, especially those from the younger categories, registering personal best times.